Kat and Karl : the beee-uuu-tiful bride! kat, jen, steph, haley, and some other kids that i don't know of the five thousand that were there! haley is either 1. picking her nose or 2. telling us to rock on. After eight years together, matt and steph are now officially an old married couple! 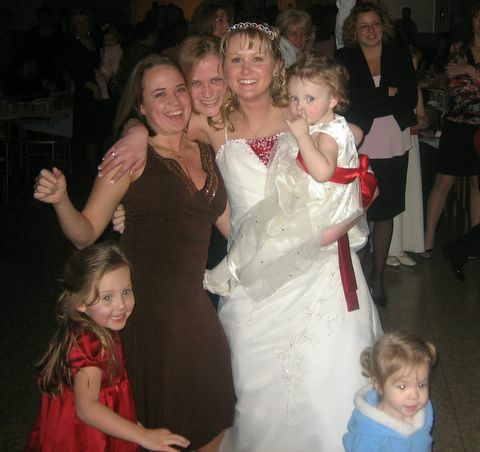 the bride was beautiful, the groom was happy and articulate, the maid of honor was knocked up! (seriously the girl (stephanie's older sister) was at least 8 and 1/2 months pregnant and she looked awesome!) the party was packed, and the food and drink were good! the short trip was very much worth it to see family (lots of family!) and catch up with some old friends! my mom said that is how all the weddings that they used to go to were (ie. ginormous! ), and she felt time-warpish. she and dad even got out and danced with us! I really like the red dresses. No pictures of the groom? Looks like a great time! Hope you had fun...450 people, that's a huge wedding. i love your dress, kat! yes........that is a nice dress, necklace, and shoes......wherever did you get such an outfit?